Dan Thirkell’s stoppage time goal helped Harrogate Railway come from behind and secure a point against Brighouse Town on Saturday afternoon. 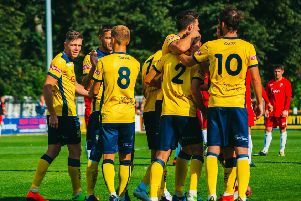 The fifth placed visitors had taken the lead with the last kick of the first half through Steven Hollingworth, but were reduced to ten men on 50 minutes when Tom Haigh was shown a straight red card. Railway had rattled the woodwork through Louis Horne before Thirkell made the most of the numerical advantage in the 92nd minute, smashing home Lawrence Hunter’s corner to seal a deserved point. Brighouse had the first opening of the afternoon when Ernest Boafo looked to claim his 11th goal of the season but was denied at the near post by Tom Goodwin. The two sides exchanged attempts in a frantic start with Jack Stockdill and Fatlum Ibrahimi going close for Railway and Goodwin keeping out Ryan Hall’s low cross with his feet. Lots of fouls and a couple of minor injuries then slowed the pace of the game, but both teams still looked for the breakthrough with Rob Worrall, who has extended his loan deal from Harrogate Town, and Hunter sending long range efforts over for the home side. Haigh and Hall looked dangerous for Paul Quinn’s men but were unable to find the target with their efforts mid-way through the half as the two teams were forced into shooting from range. Brighouse then took the lead in first half stoppage time when Hollingworth had headed into an empty net following Goodwin’s save from Boafo bouncing kindly to the striker. It was a frustrating time to concede for Railway, but the outlook of the game changed yet again five minutes after the restart when Brighouse were reduced to ten men. Haigh went crashing into Worrall which prompted ugly scenes as players squared up to one another in the heat of the moment before referee Peter Henger consulted his assistants and deemed the tackle worthy of a red card. After the dismissal, the contest fell back into its stop-start rhythm as second half substitute Nathaniel Pells made an excellent last ditch tackle to deny Hollingworth the opportunity to grab his second. Despite being a man down, Brighouse showed why they are pushing for a play-off place and continued to threaten the Railway goal. Goodwin saved well from Hall and Christopher Fisher before scrambling away an effort from Hollingworth, although the striker should have done better with his chance that came as a result of Boafo’s quick counter. Railway then came inches away from an equaliser in the 78th minute when, after Hunter’s corner was only cleared as far as Thirkell, Horne headed the skipper’s cross onto the bar. Brighouse had a golden chance to seal the win with just a minute left of normal time as Railway were pouring men forward in search of an equaliser leaving Daniel Facey with a one on one opportunity that Goodwin managed to keep out with his feet. And Railway made the visitors pay for not taking their chance in the 92nd minute when Hunter’s dangerous delivery was poorly cleared and picked up by Thirkell who smashed through a crowd of players to level the scores. The hosts could have snatched a winner at the very death when another Hunter corner caused problems for the Brighouse defence, though was this time headed wide at the back post by Stephen Bromley. After two come from behind draws, Harrogate Railway face a trip to Clitheroe next Saturday where Ashforth’s men will be looking to continue their run of positive results.